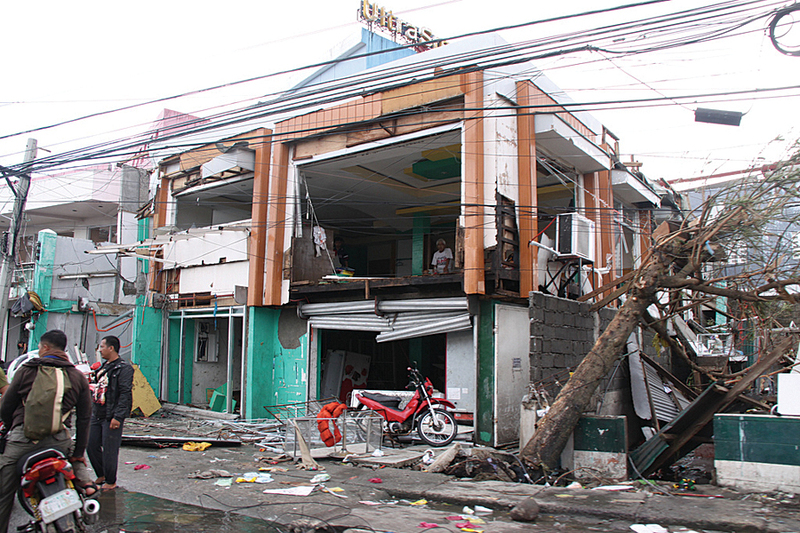 Typhoon Haiyan, which devastated portions of southeast Asia in November 2013, is the deadliest typhoon to hit the Philippines. Photo courtesy of the European Union Humanitarian Aid and Civil Protection department. 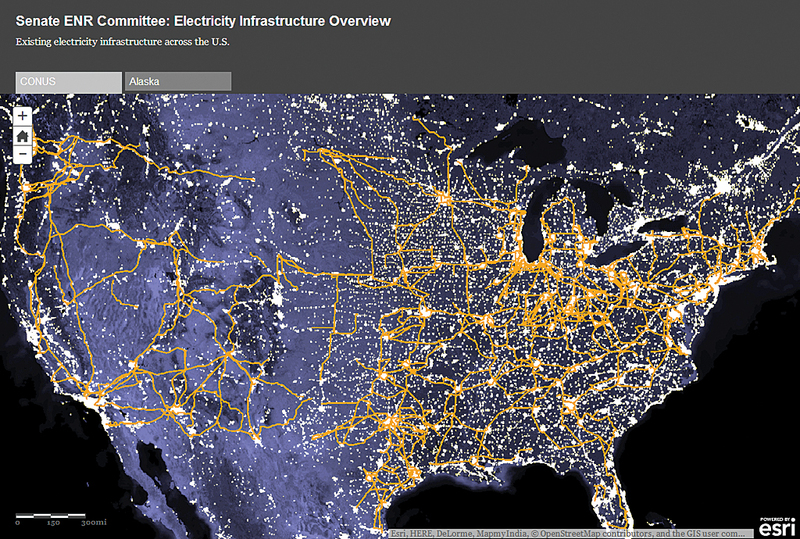 He showed how GIS is being used to transform the way the United States and other nations are addressing climate change. Created to better understand and safeguard the earth, GIS is the framework for devising strategies for dealing with a world roiled by the effects of climate change. The National Climate Assessment for 2012 notes that extreme weather events, such as droughts, high-intensity hurricanes, and severe flooding, have increased and are likely to continue increasing as the world’s climate warms. These events seriously impact the world’s population and its economic well-being as well as the environment. Although climate change is typically discussed at the global or national level, communities are on the front line of climate change, dealing with wildfires, floods, and droughts. Mitigation, response, and recovery efforts originate at the community level. As environmental conditions shift, familiar policies and standards become obsolete. Communities need to better understand these conditions and adopt policies and procedures that reflect this “new normal.” They need new ways to keep citizens safe and businesses operating. Only through understanding the risks communities face can proactive policies be developed and implemented that will increase their long-term resilience to the effects of climate change. GIS is the technology that harnesses this framework so data can be explored in context, patterns discovered, information generated, and scenarios tested. It has evolved from applications that merely collect and display data to systems that can perform complex simulation and modeling. The utility of GIS in addressing climate change extends from its tools for integrating big data from sensors and other unstructured data sources with managed and location data to the design models for evaluating strategies to planning the implementation of the best of those strategies. GIS tools can integrate big data from sensors and other unstructured data sources with managed and location data, providing a comprehensive perspective. The development of the ArcGIS platform, and especially ArcGIS Online with its maps, apps, and services, has opened the power of this framework beyond specialists and scientists to policy makers, knowledge workers, and citizens. It lets anyone ask questions of the data without ignoring its complexity. In dealing with the earth’s altered circumstances, the ArcGIS platform enables multidisciplinary collaboration in a way that promotes the dialog that is so vital in creating the societal will—often so difficult to obtain—that is necessary for success. The Urban Observatory, introduced at the Esri User Conference last year, uses the ArcGIS platform to help better understand cities. The world is an increasingly urban place with estimates that the majority of the world’s people will live in cities by 2050. Many of those cities, located in coastal areas, are among the most vulnerable to the effects of climate change. Much can be learned from studying cities but, until recently, the data on those cities was collected at different scales and in different ways, making comparison problematic. The Urban Observatory, through its use of ArcGIS, integrates information by mapping this data, standardizing its scale, and allowing for visualization and more detailed comparison of cities. Richard Saul Wurman, Radical Media, and Esri created this tool for understanding cities. Learning about which strategies work and which don’t can save lives and potentially trillions of dollars. 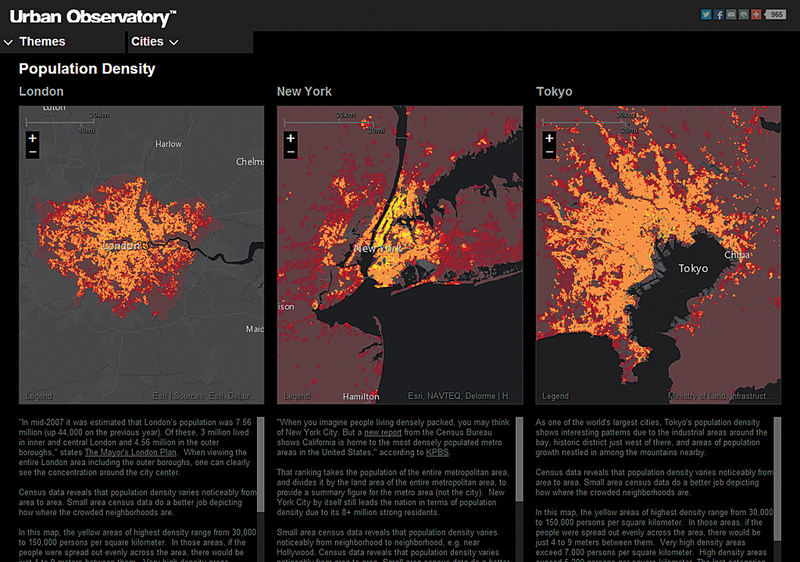 Urban Observatory continues to grow with the addition of 105 new maps in May 2014. It returns to Esri User Conference this year, with an interactive showcase that leverages touch screens, multimedia content, and advanced, cutting-edge display technology. The Urban Observatory, through its use of ArcGIS, allows an "apples-to-apples" comparison of cities. ArcGIS Online, a vital component of the ArcGIS platform, lets individuals and organizations capitalize on the abundance of resources it makes available by using Esri Story Map apps. These apps simplify the map creation process so people who are not GIS experts can combine and explore resources and integrate related data and observations. This can let them better understand and communicate the effects of climate change so more effective adaptive measures can be adopted. 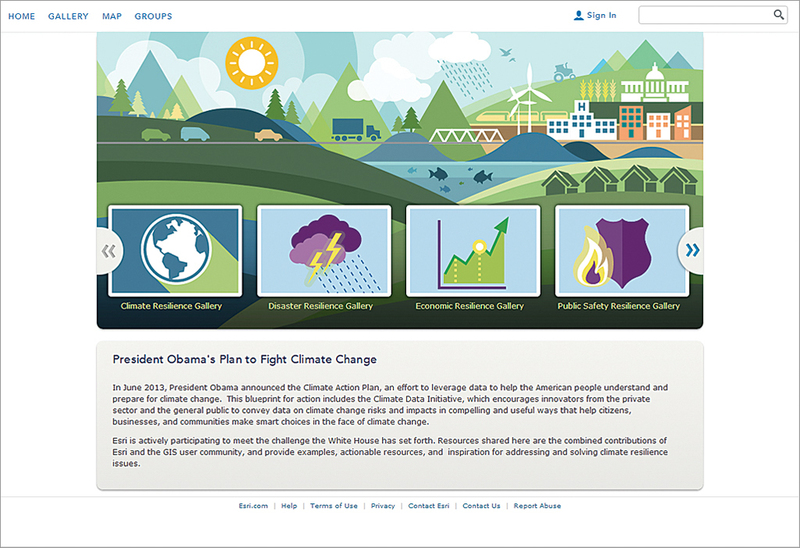 Esri is hosting a new geocollaboration portal on ArcGIS Online as part of its support of the White House Climate Data Initiative. The initiative, part of the larger Climate Action Plan, encourages tech innovators to develop apps that use the government’s climate data in a way that helps citizens, businesses, and communities make decisions that will mitigate the impact of climate change. The geocollaboration portal is a mechanism for sharing knowledge and resources. People use it to discover, contribute, and share resources critical to confronting the impacts of climate change. 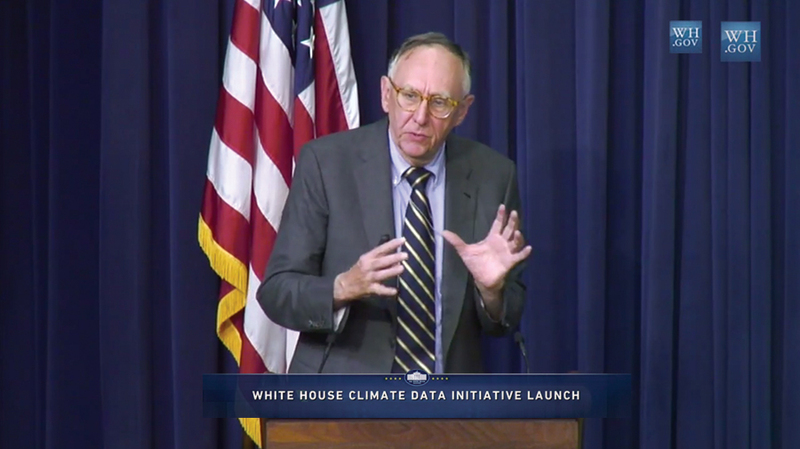 “We felt it was important to establish this collaborative network of individuals and organizations that use GIS to come together to combat the impacts of climate change,” said Dangermond. The Esri portal contains maps and other resources organized into various categories of resilience: climate, disaster, economic, public safety, and transportation and infrastructure, as well as the UNISDR Making Cities Resilient gallery. UNISDR, or United Nations International Strategy for Disaster Relief, launched the Making Cities Resilient campaign in 2010 to address the issues of local governance and risk in urban areas. 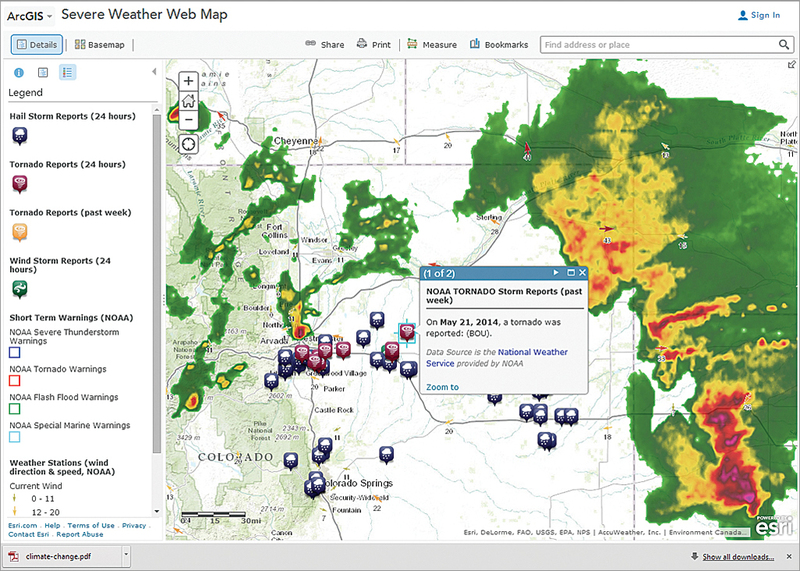 The geocollaboration portal (resilience.maps.arcgis.com/home/) is a mechanism for sharing knowledge and resources. Open to anyone in the world, the contest will award prizes to the developers of the top three applications that focus on solutions to climate-related issues. With these apps, regional government agencies, businesses, and others would have the tools to make the data already regularly collected by agencies such as National Oceanic and Atmospheric Administration (NOAA) and the National Aeronautics and Space Administration (NASA) useful. For example, apps could improve preparation for and reaction to severe weather events. Apps will be judged on the creative use of data, Esri apps, maps, services, and APIs. 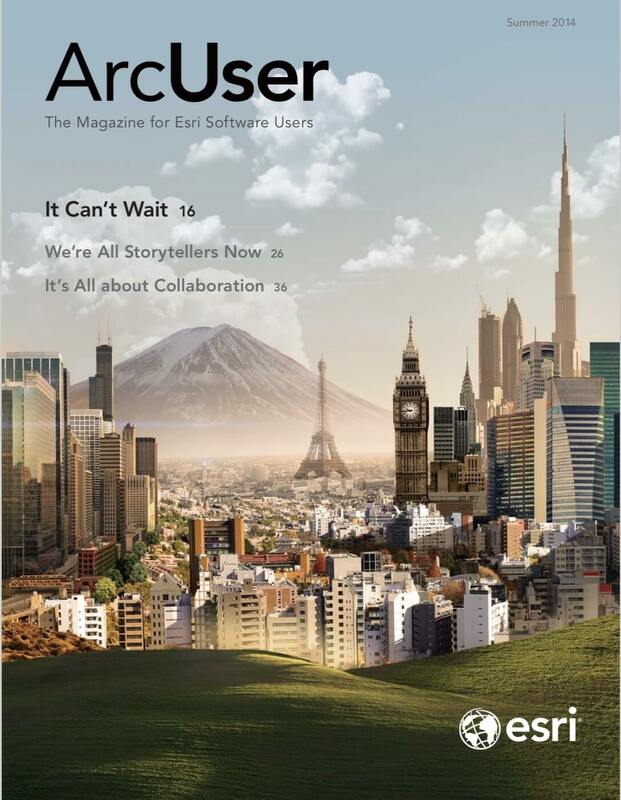 Winners will be recognized at the Esri User Conference in July 2014. In addition to its support of the White House Climate Data Initiative, Esri has partnered with the UNISDR to build a global community of resilient cities with the aid of GIS technology. This agreement builds on an existing UNISDR campaign, Making Cities Resilient. Esri is committed to providing expertise, support, and capabilities on a global scale for the Making Cities Resilient effort. Data and other resources gathered by government agencies and others are made readily available through the geocollaboration portal. At the 2014 Esri User Conference, Esri will launch an app challenge centered on UNISDR’s 10 Essentials for Making Cities Resilient to be followed by a competitive grant program that awards ArcGIS Online for Organizations accounts to selected cities and nonprofits. Successfully applying GIS requires the right data—the data needed to address a specific issue—in a format accessible to tools that can produce meaningful information. Making that data accessible requires support for open standards and interoperability, something that Esri has long supported through its active participation in the development of various standards such as those supported by the Open Geospatial Consortium (OGC). In May 2014, Esri announced its support for a new OGC specification, the GeoPackage Encoding Standard. “Esri continues to add support for many open and interoperable data sources,” said Keith Ryden, the Esri software development team member who led Esri’s work on GeoPackage. Adding GeoPackage support was a natural progression to Esri’s previous support of the OGC’s various other standards. The increasingly devastating effects of flood, wildfire, drought, and other calamities that have been accentuated by climate change make it apparent that the status quo is no longer sufficient. The regulations, policies, and procedures that were once effective in protecting lives, property, and prosperity are no longer viable in this rapidly evolving world. GIS is uniquely suited to address this complex process of assessing risks and developing strategies for minimizing those risks. This map, created for the Rockefeller 100 Cities Centennial Challenge, highlights areas and infrastructure related to resilience to the effects of climate change. Esri was founded on the belief that geography is at the heart of a more resilient future. It is actively engaged in the quest to better understand and tackle the problems associated with climate change. The ArcGIS Platform supports an ecosystem of maps, apps, and services that fosters the creation, integration, and sharing of information about the state of the planet. Esri supports standards that make this possible and the tools that enable developers and users in the private and public sectors to formulate innovative approaches for dealing with the pressing problems associated with climate change. 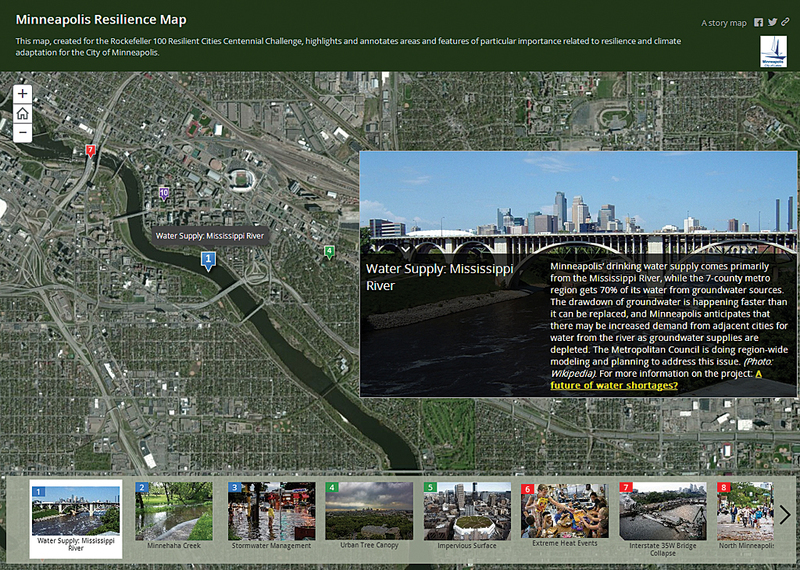 Esri has partnered with other organizations working on complex climate challenges. These partners include the International City/County Management Association (ICMA), National Association of Counties (NACO), National League of Cities (NLC), Tumml, American Public Works Association (APWA), American Planning Association (APA), Association of State Floodplain Managers (ASFPM), American Water Resources Association (AWRA), International Association of Fire Chiefs (IAFC), Local Government Commission (LGC), National Association of Development Organizations (NADO), National Alliance for Public Safety GIS Foundation (NAPSG Foundation), National Information Sharing Consortium (NISC), National Oceanic and Atmospheric Administration (NOAA), National Association of County and City Health Officials (NACCHO), Trust for Public Land (TPL), and Public Technology Institute (PTI). Esri is committed to providing the platform and tools that will help communities throughout the world access content, do analyses, share results, and together meet the challenges of climate change.